Medidor mecánico de tanque para una medición precisa y confiable de nivel. 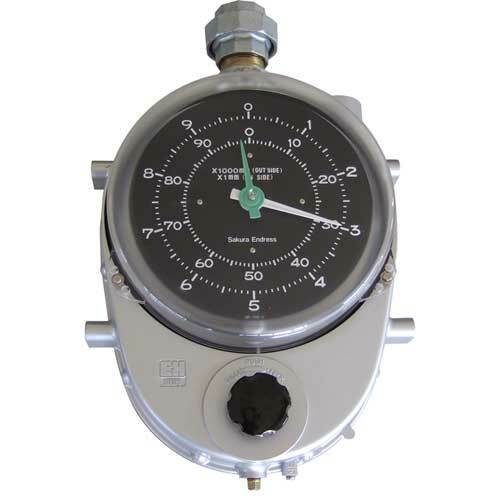 Seal pot SGP/AC4A, Rp 1-1/2"
Material: tank side, gauge side steel. Elbow material: AC4A. Connection: thread, PS 1-1/2". Seal pot 316/316, Rp 1-1/2"
Material: tank side 316, gauge side 316. With paraffin oil 2 litre. Elbow material: 316. Connection: thread, PS 1-1/2". Material: tank side steel, gauge side steel. With paraffin oil 2 litre. Elbow material: aluminum casting, 4A. Connection: flange JIS 10K 40A RF. Material: tank side 316, gauge side 316. With paraffin oil 2 litre. Elbow material: 316. Connection: flange JIS 10K 40A RF. Material: tank side PVC, gauge side PVC, with paraffin oil 2 litre Elbow material: PVC. Connection: flange JIS 10K 40A FF. Cover, aluminium, with drain plug, paking, cork. Usage: LT5. Installed at top pipe end. Usage: LT5, LT11/LT12. Low pressure. Thread connection. Usage: LT5, LT11/LT12. Complete set, welded socket. Material: SUS316. Usage: LT5, LT11. Complete set, threaded socket, Case ADC. Internal part, SUS316. Usage: LT5, LT11. Top anchor SUS316 threaded, PT1"
Complete set, theaded socket, all 316. Usage: LT5, LT11. Top anchor, cover, ADC. Usage: LT5, LT11. Low pressure, 5Kg. Usage: LT5, LT11/LT12/LT14/LT16. Low pressure, 8Kg. Usage: LT5, LT11/LT12. Se ha desarrollado el calibrador de flotador LT5 para todas las áreas de la industria. Muchos años de funcionamiento en una amplia variedad de aplicaciones han demostrado su fiabilidad.